These waffles have a nice light texture, and a subtle touch of corn. I made them with the heart shaped waffle iron. Makes 10 waffles (like in the photo, totalling 50 heart waffles). Feel free to replace the sugar with another sweetener (or you could also try leaving it out altogether). In a large bowl, mix the dry ingredients: flour, baking powder, baking soda, salt, and cornmeal. In another large bowl, mix the wet ingredients: oil, soy milk, soy yoghurt, lemon juice and lemon zest and sugar. Bake the waffles according to the instructions of your waffle iron (in our case, being 5 to 6 minutes on level 7). 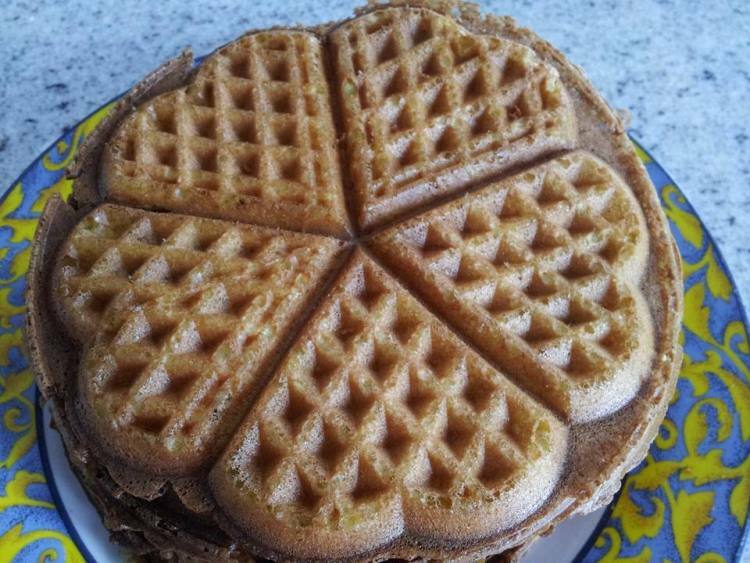 The recipe for these vegan lemon corn waffles is based on one in Vegan with a Vengeance, by Isa Chandra Moskowitz. In this cookbook, it says this recipe makes 14 regular waffles (or 4-6 Belgian waffles). However, We could make 10 waffles with these ingredients (like the one in the photo, totalling 50 small heart shaped waffles). I wouldn’t make Belgian sized waffles with this recipe, since Belgian waffles (which are actually called Brussels waffles in Belgium) normally have a very light bubbly texture, which these waffles don’t have.